Everyone knows that congestion is uncomfortable and inconvenient. Unfortunately, baby chest congestion happens too. In fact, baby chest congestion is more common than adult chest congestion because babies have immature immune systems and are frequently exposed to children who are suffering from respiratory illnesses. Read on to learn what causes baby chest congestion and how you can treat it. What Causes Baby Chest Congestion? The common cold. Colds cause the mucus formed in the nose and throat to drain into the chest. This mucus can build up in the chest and cause congestion. Low immunity. Babies often struggle to fight the germs that cause many common illnesses because of their immature immune system. Exposure to viruses. Babies are at higher risk of developing chest congestion because they have come into contact with children or adults who carry common cough and cold viruses in hospital or at home. The steam from a running shower can loosen your baby's chest congestion and allow him or her to breathe more easily. Turn your shower to the hottest setting, close the door of your bathroom, and let the room fill with steam. Once the room is steamy, bring your infant into the bathroom and sit with him or her for 10-20 minutes. You can also try running a cool-mist humidifier inside your baby's bedroom. You can break up mucus and encourage coughing by tapping your baby's back gently. The American Academy of Pediatrics suggests that you lay your infant face down across your knees and use your cupped hand to gently rub and tap her back. Be sure to carefully support the neck of younger babies. Increasing your baby's fluid intake will thin the mucus and help to relieve baby chest congestion. If your infant is breastfeeding, urge him to eat as often as you can. If bottle-fed infants do not want to drink formula, offer them juice or water instead. Drinking fluids will also prevent your baby from becoming dehydrated. Drip a small amount of saline solution into your baby's nose. After waiting about three minutes, use a bulb syringe to clear out her nose. Doing this every few hours can help to remove some of the mucus before it drips down your baby's throat and aggravate chest congestion. Using either a humidifier or a vaporizer in your baby's room many help to loosen the mucus in his or her chest and nose. Make sure that you do not place the machine next to your baby's crib. Many menthol products are made specifically for babies—adding these to a vaporizer can help to relieve congestion. Place your child in the car seat until he or she falls asleep. This will prevent mucus from building up in her chest while she sleeps. Not every stuffy nose requires medical treatment. If your baby's nose isn't bothering him, there's no need to do anything about it. If your baby is still active and eating and drinking normally, it's okay to just wait and watch. Never give cold and cough medication to children under the age of 4. Ask your pediatrician before giving medicine to a child between the ages of 4 and 6. 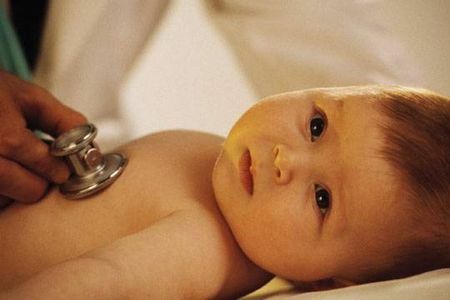 Take your baby to your pediatrician if her chest congestion does not clear up within a few days. How Long Can Children Recover from Pneumonia? Whooping Cough, How Is It Transmitted? Why Does Baby Twiddle? Should You Discourage It?